We are a boutique IVF clinic , and we have only two doctors . Dr Anjali and I take care of all our patients. This has a lot of advantages , because we have a lot of experience and expertise , and I think we complement each other very well . For example, I find it easier to establish a rapport with the husband, while the women often find it easier to talk to Dr Anjali . We also have different viewpoints , we will often share our differences in front of the patient . For example, if we are treating a difficult patient with poor ovarian reserve, and have to decide whether or not to cancel her cycle, Dr Anjali will call me during the scan, and we will discuss the options. Sometimes we deliberately disagree with each other in front of the patient – for example, I may say we should cancel the cycle , and she may say we should go ahead , or vice versa . We think this is helpful for the patient , because she can see that there are no black or white answers in medicine , and that she does have multiple options . This encourages her to apply her own mind, and offer her own personal preferences, so we can factor these in when making a final decision. 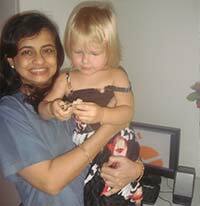 Having Dr Anjali around all the time is very helpful for me professionally. It allows me to critically look at a diametrically opposite point of view , so we both are sure that we've carefully analysed all the available choices, and helped the patient to select what she is most comfortable with. This kind of debate forces us to examine the pros and cons of all the choices, which can be very reassuring for the patient, because she can see we are being thorough in our analysis. This way, no matter what the final outcome, she has peace of mind that a proper process was followed transparently. Thinking out loud provides a lot of comfort for the patient. It’s also very reassuring for me, because it can be quite mentally taxing to have to make such difficult decisions on my own, and having Anjali around to share my burden is a big relief. Two heads are better than one, and I jokingly tell my patients that they are getting a second consultation at no extra charge ! However, it also requires an extremely mature patient to understand what we're doing , and why we are doing this. Some patients are worried and concerned when they see us “disagreeing”, because they feel that if the doctors don’t see eye to eye, this means they are confused, and they aren’t sure what to do next. This is why we are much happier treating mature, well-informed patients, who understand that medicine is an imperfect science ; that there’s a lot of uncertainty associated with IVF treatment; and that discussing this openly helps patients to make a decision which is right for them. Want to find out more about Malpani Infertility Clinic ? Please send me your medical details by filling in the form at www.drmalpani.com/free-second-opinion so that I can guide you ! You must have included a picture of both of you !